Hundreds of people from the Santa Clarita Valley community and beyond descended on Saugus High School Sunday afternoon to remember the life and legacy of Maj. Stephen “Cajun” Del Bagno, the United States Air Force Thunderbirds No. 4 Slot pilot who died in a training exercise April 4. A funeral procession from Eternal Valley Memorial Park & Mortuary began around 4 p.m. Sunday afternoon and carried the remains of Del Bagno. Community members lined the streets along the path of the procession to show their support for the airman. 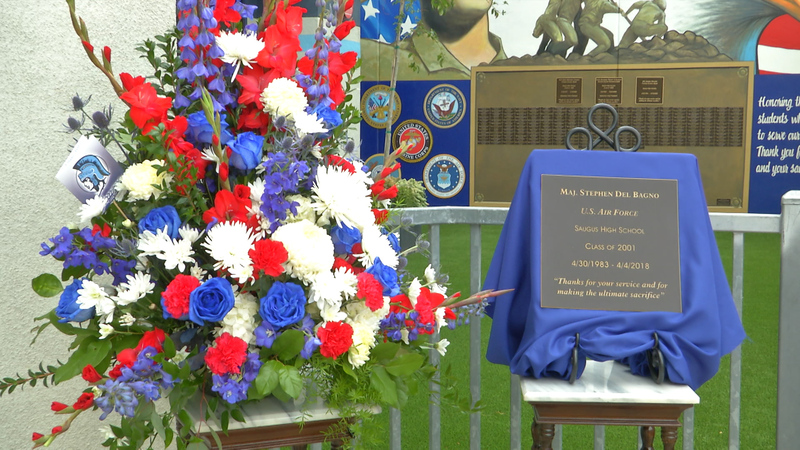 A memorial was held at Saugus High at 4:44 p.m. included speeches by family and military colleagues, a flyover that includes F-35s and F-16s, a 21-gun salute and taps. SCVTV will air the full funeral procession and memorial ceremony on Monday, April 16, 2018. He is a 2005 graduate of Utah Valley State University, and commissioned from Officer Training School, Maxwell AFB, Ala., in 2007. Before joining the Thunderbirds, Del Bagno served as an F-35A Evaluator Pilot and Chief of Standardization and Evaluation, 58th Fighter Squadron, Eglin AFB, Fla., according to his biography on the Thunderbirds website. He’s known around the Santa Clarita Valley as a neighbor and a 2001 Saugus High School alumni who participated in sports, including varsity soccer and basketball. The team’s participation at the March Air Reserve Base “The March Field Air & Space Expo,” as well as performances at the Lakeland and Columbus Air Force Bases were canceled after Del Bagno’s death. It is unknown how this incident will impact the remainder of the 2018 Thunderbirds season.